Thursday: Robin's Zodiac Yoga is free on Congress Square Park Portland with live music by Helena Nash 5:30-6:45 pm. Attune your body and spirit to the Leo season with this astrologically inspired sequence. Corner of Congress and High Street across from the State Theatre and Portland Museum of Art. The Moon is in Libra from 11:37 am on. In the earlier hours a void of course Virgo Moon spans 2:31 am to 11:37 am EDT and it's best to keep routines and maintain order and simplicity. Libra Moon aligns with Mars and the Sun in Leo. This is a very social day favored for gatherings, parties, dates, and action on partnerships and agreements. Today's color is Pink. Friday: Libra Moon meets Jupiter and squares Pluto. Expect questions and considerations about the value of growth and progress versus what seems too excessive or creates anxiety. This can be a very positive day for partnerships and agreements. Some will move past fears, but not without effort and surrender. Notice where the resistance is and question it. What's it about? Is it real or connected to a false perception or lack of knowledge and answers. Push for what's right and fair. Today's color is Lavender. Saturday: Libra Moon aligns with Saturn, Venus and opposes Uranus. All three planets are in fire signs. Moon and Venus smile on the social occasions and on romantic love. Saturn is retrograde until August 25th, so you may investigate a solution or closure, but need to wait it out through a delay or for the best possible terms. Emotions may feel off kilter with the Uranus opposition. Avoid impulsiveness. At 5:30 pm EDT the Moon is void of course until moving to Scorpio at 8:23 pm EDT. Tune into the spiritual or invisible aspects of any situation. Today's color is Red. Sunday: Scorpio Moon, 2nd quarter at 11:23 am EDT. This lunar marker suggests progress. Venus in Gemini aligns with Uranus in Aries. Fickle and unpredictable in relationships, this could lead to a surprise or spark interest between potential lovers. The Moon makes a variety of other planetary aspects. If you're feeling creative or romantic, it's an easygoing day/night. If you're in an argumentative mood, today could be frustrating and uneasy. Maroon is today's color. Monday: Scorpio Moon void 7:10 am to 8:01 am EDT on Tuesday. Today is rather unpredictable and may include spontaneity and changes of plans. Also, it may be a day to keep to yourself and take care of your priorities or private business. The Moon aligns with Pluto in Capricorn, related to privacy, secrecy, and perceptions. Today is colored by depth and feelings. Some may want to skip that and favor escapism, getting into the Sagittarius Moon mode a bit prematurely. We'll tend to go to great lengths with what we do. Venus moves to Cancer at 10:54 am EDT. Sentiment, romance, the past and family are characteristic of Venus's time in the sign of home. Today's color is Black. Tuesday: The Moon sails to Sagittarius at 8:01 am EDT. Some will come out of their shells or out of dark moods in favor of adventure or exploring through conversations and books. Moon and Mercury in Virgo are square and may contain sharp edges related to communication or educational plans. You may spend more time negotiating than you want to or hoped for. Agreements will take effort and time, and scheduling may too. Blue is today's color. Wednesday: Sag Moon harmonious with Jupiter, Sag's ruling planet and with Mars in Leo. The Moon and Saturn also meet. Mars boosts energy and initiative. Courage and strength come into play. Jupiter favors wise action and expansion plans. Saturn is a bit of a bug, and a retroactive solution or agreement may come through. Delays may continue to plague though, as Saturn favors patience while retrograde. Do not put things off though, unless they can wait until after September 5th. Today's color is Purple. 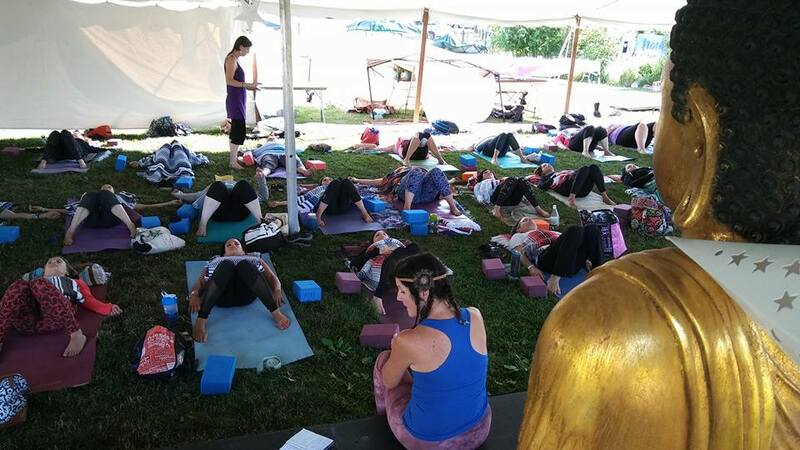 Robin's Zodiac Yoga with live music by Helena Nash is this week on Thursday the 27th on Congress Square Park Portland, Maine. Come for the yoga or the music or both and enjoy a free evening out. Leo zodiac sequence with insights about summer astrology and awakening your body and soul to summer of 2017. 5:30-6:45 pm. Thursday: Mars moves into Leo at 8:19 am EDT for a stay until September 5th. Mars is in the fire element during these weeks, which is more natural and powerful than Mars' time in Cancer. The tendency is to be more active, to deal with things, to be more courageous and find your strength. The sexual side of Mars is stronger in Leo too. The powerful animal inside gets a voice, an opportunity, and maybe the spotlight. You'll notice who vies for attention. Gemini Moon today meets Venus and aligns with Jupiter. It's a fabulous day for a date or a networking meeting. Gemini Moon opposite Saturn retro and hard subjects may surface too. Sun squares Uranus in the evening and there's an energetic though abrupt nature to this. Look before leaping. Family issues may be triggered too. Today's color is Red. Friday: Void of course Moon is 1:41 am to 4:09 am EDT. It's a convenient time if you sleep then since the lack of judgement or progress of void hours is best spent dreaming. Cancer Moon with no major aspects for the rest of the day. Nourish and nurture, others and your self too. Today's color is Light Blue. Saturday: Leo time begins at 11:15 am EDT. Babies born before then are Cancers. The Sun's shift of sign leads us into the peak of summer, and the New Moon is Sunday. Freshen things up. Get ready to take action, live your life, move out of a funk, and welcome the unexpected. Cancer Moon continues with a variety of angles to planets including opposition to Pluto which stimulates emotion and inner processes and sometimes makes one feel more anxious or more ready to face a situation. It can play out either way. This dark Moon is time for reconsideration and issues around justice and healthy growth may dominate the mind. Today's color is White. Sunday: New Moon in Leo at 4:34 am EDT. The Moon changes signs at 2:05 as Cancer Moon and Uranus square. One thing this indicates is more family matters and news. The New Moon leads us into eclipse season as our next Full Moon comes with an eclipse and so will the August New Moon, also in Leo. Lions and Lionesses, changes are in the air even if you don't know what they are quite yet. The Moon meets Mars for action, competition, performances, showing off, and creativity. Keep the risk level low though. Avoid physical exertion that could be 'too much'. Passions run high today. Wear Purple. Monday: Leo Moon and a whole bunch of astrological action. New Moon propels us forward and initiates events and people, some of which seemed 'not ready yet' or not yet time. Everything may seem to move faster. Venus opposes Saturn and brings up unresolved relationship matters, items that are up for debate again, and re-negotiations. News and developments are likely in all kinds of circumstances and situations. Today's color is Orange. Tuesday: Void Moon in Leo 5:22 to 6:32 am EDT and then Moon to Virgo. Mercury enters Virgo at 7:41 pm, the first planet to move to Virgo this year. Mercury is at home in Virgo, ready to sort, organize, analyze and perfect. We'll feel like making plans and setting dates. Do some financial planning or pay the bills. Moon and Mercury meet in Leo at 5:22 am for a very social day too. It's a good day to rehears or perform, create and keep the kids busy with good stuff. Wear Navy Blue. Wednesday: Virgo Moon for working the land or building, cleaning, and taking care of details. Read the fine print. Flow where there's momentum. Mercury will be retro August 12th for a few weeks, so now is a better time for agreements, purchases, and setting dates. The Sun and Mars meet in Leo for a wild burst of love, creativity or taking strong action. Today's color is Yellow. All Yoga classes listed are in Maine. Plan on RoZoYo® outdoor yoga Thursday, July 27th. Free downtown Portland event with music performed by Helena Nash. Eclipse season Yoga with a Leo theme on Congress Square Park Portland, Maine 5:30-6:45 pm! Bring a mat. Thursday: Pisces Moon meets Neptune, squares Venus in Gemini, and aspects Pluto in Capricorn. Pluto recently connected with the Full Moon and similar themes to the past weekend emerge and recirculate. Transformation is the theme. Escapism could be holding you or someone around you back. Emotions can overwhelm or you can meet them head on and get past fear or allow yourself sadness, or whatever the situation is, immerse rather than run. How understanding can you be, of yourself or another, without losing good judgment or an important boundary? Understanding doesn't mean you can't draw appropriate lines. Take advantage of highly creative and romantic Moon/Neptune conjunction. Today's color is Light Green. Friday: Pisces Moon trine Cancer Sun and Mars. Moon and Saturn retrograde are square and Mercury aligns with Jupiter. Growth, abundance and fertility themes. Going back over old business and recurrent patterns happens with the Pisces/Cancer and Saturn retrograde aspects of the day. Maybe this time we get it right? Learn from the past. Mercury and Jupiter favor big plans and events where many gather. Moon void from 1 pm to 7:52 pm EDT and then into Aries. Today's color is Orange. Saturday: Aries Moon aligns with Venus and is opposite Jupiter. It's a social day, and spontaneous adventures happen. Accept a last minute invite. Some of us will face terms and attempt compromises and peacemaking even if feelings are mixed. Avoid selfishness and aim for what's fair and just. Red is today's color. Prenatal Yoga 9 am at Greener Postures in W. Falmouth. Sunday: Aries Moon with a mix of aspects that culminate with the Moon/Uranus monthly meeting. Things heat up rapidly and change quickly. Be careful around volatile people and unpredictable situations. Do not engage in risk taking behaviors. Chill and lay low if life is stressful or tense. Void of course Moon 10:19 pm until Monday 1:04 am EDT. Today's color is White. Deep Stretch 5:30 pm at Greener Postures in South Portland. Monday: Taurus Moon. Venus squares Neptune for interesting changes of heart. Deception is in the air. Seek honesty and truth. Mars squares Uranus, and it's not likely to be easy or pleasant since Mars is out of his element in Cancer and Uranus is a wild card. Acting on and expressing feelings or demands could get out of hand. Stay in your safety zone with people and temper your reactions. Today's color is Pink. 6 am Heated Flow at Greener Postures in South Portland. Tuesday: Taurus Moon with many planetary alignments. The energy is a bit more easygoing today, though all of yesterday's forecast still remains true. Venus and Jupiter align beautifully for social gatherings and legal contracts and agreements. Dates and first meetings are favored too. Wear Blue. Wednesday: Void of Course Moon in Taurus from 2:11 am to 3:31 am EDT. Gemini Moon takes over. Mercury aligns with Saturn retro in Sagittarius. Many will go over terms, make educational decisions or consider them, and it's likely things will be up for debate or discussion. Today's color is Yellow. Thursday: Warming up for Sunday's 12:07 am EDT Full Moon in Capricorn. Sagittarius Moon aligns with Jupiter, squares Neptune and meets Saturn. Questions come up about whether to face realities or try to escape. Escapism can involve drugs or delusions and ultimately will not get you what you want. Saturn and Jupiter urge wisdom and justice. What is the most mature decision and most fair action you can take? Some of this will relate to the past and what's been unresolved or not taken care of properly for a long time. Today's color is Light Blue. Friday: Sagittarius Moon begins the day, void of course 10:12 am to 1:45 pm EDT when Capricorn Moon waxes toward Full. Mercury and Venus align in Leo/Gemini for social interactions, friends gathering and getting in touch, contractual agreements especially in the arts or publishing, and general positivity. Moon trine Uranus at 10:12 am, with the urge to begin, to create original and unique products or content, and a feeling of quickness. Ready or not! Capricorn Moon is without significant aspects for the remainder of this date and much of Saturday. This is the sign of structure, the bones and building. The Sun is in Cancer. Combine the energies of these opposing signs to grow and nurture things from the ground up. Expect completions and things coming full circle. Use wisdom gently and with care as you guide someone through a transition or through fear. This is a peak time emotionally and in terms of grounding, family and faith. Today's color is Gold. Saturday: Capricorn Moon is Full after midnight tonight, 12:07 am EDT. In Pacific and Central Zones in the USA, the Moon is Full tonight. Capricorn brings themes of teaching and leading, wise action, completion of goals, and incorporating the nourishing traits of Cancer where the Sun is. Soften your tone. Speak with authority and yet with compassion. Moon aligns with Neptune for spirituality and faith in outcomes. The creative and orderly blend well together. The Moon and Jupiter bring up questions of fairness, justice, legalities and aim for a structured, just response where it's needed. Ask for help, advice and the wisdom of experience. Find your strength and resourcefulness without putting up big boundaries or fronts that push people away. Steady yourself for the most right action. Today's color is Indigo. Sunday: Full Moon meets Pluto at 2:06 am EDT. Confront a deep feeling or fear with courage and faith. Get past a block and let go of what's not working for you. This is an emotion filled conjunction and a peak in situations related to the past, transformation and metamorphosis, and becoming. Some times we must let go of an old belief, a grudge, and negative emotions in order to become and to move forward. This might be hard or scary, but your instincts will tell you if it's time and if this resonates with you. If you're procrastinating about something big because you're concerned about how it will play out, this may be the time. Doing things willingly, with surrender, is so much better than being cornered or forced when situations have gone farther or deteriorated more. How resourceful and brave can you be? Mars and Uranus are at odds with the Moon today, and suddenness or anger may not be friendly. Move and act with calm and clarity. Void Moon 10:12 pm to 1:35 am EDT. Today's color is White. Monday: Aquarius Moon time begins 1:35 am EDT. Aquarius is the zodiac's inventor and visionary. Apply that to your own life. Sun opposite Pluto continues the Pluto themes of yesterday, yet the feeling may be brighter. Be practical in your actions. Moon trine Venus and opposite Mercury. Communication will be very important. Prioritize returning calls and going over terms, for example. Socially, this Moon and Venus favor events, meetings and dates. Business-wise, collaborate and bring out each other's best talents and traits. Turquoise is today's color. Tuesday: Aquarius Moon aligns with Jupiter and Saturn. Take agreements seriously. Expect long term results of what you engage in. Tap into intelligence, logic and reason. Also, have a sense of adventure and open mind. Today's color is Blue. Wednesday: Void of Course Moon 8:40 am EDT to 11:51 am when the Moon shifts to Pisces. Moon and Uranus align at 8:40 for original and/or quick thinking. A fast response or action may be needed. Pisces Moon encourages intuitive flow. Today's color is Green. July's Robin's Zodiac Yoga is on the 27th at 5:30-6:45 pm Congress Square Park in downtown Portland, Maine. Flow for Leo time. It's free of charge. I hope you can come!